Isaiah Schuette, white shirt, is pictured with his family during the 15th annual Christine’s Christmas Concert held Dec. 8 to benefit Make-A-Wish. Schuette samples some of his productions on his new equipment. 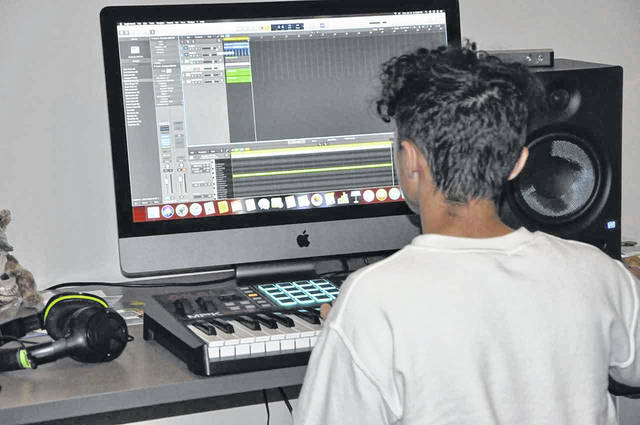 Seventeen-year-old Isaiah Schuette has a passion for producing music. That passion is complemented by a natural talent for blending beats and melodies together to create fresh new tracks. While he doesn’t recall a specific moment when producing came to the forefront — perhaps it was time spent with a friend in their studio — Schuette said he’s always enjoyed music. Today, that passion runs deeper than ever, heightened largely because of the struggles of yesterday. On Feb. 2, 2016, Schuette was diagnosed with Mixed Phenotype Acute Leukemia (MPAL), more commonly known as mixed lineage leukemia. MPAL is made up of two different forms of leukemia: acute myeloid leukemia (AML) and acute lymphoblastic leukemia (ALL). In addition to those two forms, Schuette was also diagnosed with a form of T-Cell Leukemia. “It was a long road ahead for him,” Schuette’s mother, Kristina Hughes, said of his diagnosis and the treatments to come. Hughes works at Nationwide Children’s Hospital and said that even though she works daily around sick children, she never thought it could happen to one of her own. Initially, Schuette underwent aggressive rounds of chemotherapy treatment. Doctors then recommended a bone marrow transplant as the best way to combat the various forms, which presented another obstacle in the form of trying to line up a compatible donor. In a stroke of good fortune, or perhaps something more, Schuette found perfect matches from two separate donors. The transplant, itself, brought on more rounds of radiation and chemotherapy treatments in preparation for the surgery. Because the treatments essentially wiped out his immune system, Hughes said her son had to be isolated in the aftermath, so much so that he was mostly unable to leave the house for a year. Although the battle was fierce, following successful treatments, Schuette entered into remission in August of last year. After missing his freshman year of high school at Delaware Hayes, he returned to school last year as a sophomore and is on track to graduate with his class of 2020 classmates. While Schuette’s diagnosis led to a battle for his life, the circumstances did, however, lead to a significant moment in his development as an aspiring music producer. Just two weeks after he was given the sobering news of his condition, he was notified he would be eligible for a wish through Make-a-Wish. That wish was granted in October 2018 when he received his very own music studio in his home here in Delaware, complete with a desktop Apple computer and state-of-the-art music equipment. The scientist now has his own laboratory, and Schuette said he has seen his talents develop since he’s been able to spend ample time working with his own equipment. Asked how much time he estimates he spends producing, Schuette said if he’s not at school or work, he’s probably working on music, at least for an hour or two. Schuette didn’t have much time to spare after receiving the studio before having to put it to good use. He was scheduled to attend the 15th annual Christine’s Christmas Concert, which benefits Make-a-Wish and is held in the Jo Ann Davidson Theatre at the Riffe Center, on Dec. 8, 2018. He was asked to produce music that would accompany a video presentation of his story and wish being granted to kick off the concert, as well as be played in the theater as seats were taken prior. Although his style typically leans toward R&B, the task of producing Christmas-themed music was no matter for Schuette, who displayed the versatility and overall mind for music that has his future bright should he choose to pursue music further. Of the day and what it was like to have his music played in a public setting, he called it a “crazy” experience that included substantially more people hearing his music than he expected. He added that the people and the exposure have made him even more hungry to succeed. For Hughes, the concert served as a celebratory ending to her son’s lengthy road to recuperation. She went on to say that while she was, by no means, surprised at her son’s talent, hearing his ability to expand into a different and specific genre such as Christmas music opened her eyes to just how capable he is. She added she will continue to encourage and support him in his music if that’s what he chooses to pursue. No matter what’s to come for Schuette, the adversity he’s already overcome has given him a perspective on life that will serve him well in any and all endeavors.